NEW product - we recommend the new Micro FlySky Rx, it has greater range and more channels than the DasMikro V2. This is the smallest 2.4Ghz radio receiver we've ever seen. It measures a tiny 10mm x 25mm and it's barely thicker than a piece of paper! Despite it's tiny size, it still boasts 7 PWM channels and a more usefully from our point of view a PPM output. The advantage of PPM over traditional PWM channels is that you only need to use one signal wire, rather than one for each PWM channel. Because of its micro size, it's ideally suited to micro quads, like the Tarot 130 racing quad. The Rx is compatible with 2.4Ghz AFHDS radios, like the FlySky FS-i6 and Turnigy 9x. The micro Rx has an auto binding function, meaning that every time the Rx is powered on, it will attempt to bind with a transmitter for a few seconds (flashing LED). If the receiver finds a transmitter (the Tx must be also in bind mode) then it will bind with it (constant LED). If it can't bind with a transmitter then it retrieves the previously bound transmitter identifier and works with it. Change FS-i6 from AFHDS 2A mode to AFHDS mode (Menu: System - Rx - AFHDS 2A OFF). Hold in bind button on FS-i6 whilst turning on radio. hi I received my order of the above item, I was wondering are your receivers shipped already programmed to ppm or will it need to be programmed for ppm as some other sellers ship? Hi, it is already setup to output PPM, you just need to connect to the PPM channel. Is it really with failsafe built in? Hi, yes it is the latest version with failsafe. 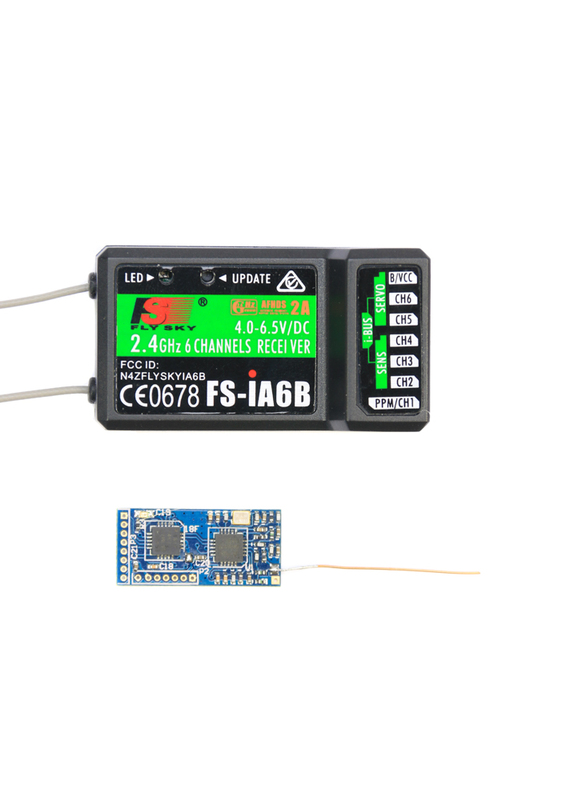 would this RX be compatible with my FlySky FS-T6 transmitter? No it's not compatible, however we've just added a Rx which is - here. wil it work whit the Tunigy Evolution? Not compatible, the Turnigy Evolution uses AFHDS 2A, this Rx use AFHDS. Hi, I can see its compatible with FS-i6x but notice above you say it isnt compatible AFHDS 2A and it looks like the new i6X uses that but it says the i6X is backwards compatible? The operating voltage also shows at 1-3s but on the other Rx they all show volts i just want to check it isnt meant to be 1-3volts. Hi, I'm not sure if the FS-i6X is backwards compatible with AFHDS, I haven't got one to test. The FS-i6 definitely is compatible.1-3S is correct.